Think fast: How many times a day do you pick up your phone to look at something? Unless you live in the tundra or have far more self-control than most, the answer probably falls somewhere between "quite a few" and "more than any sane person could count." Assuming you keep your device properly secured, that means you're doing an awful lot of unlocking — be it with your face, your fingerprint, or the code you tap or swipe onto your screen. And that's to say nothing of the number of times you type your password into your laptop or enter your credentials into an app or website during the day. Security's important, but goodness gracious, it can be a real hassle. Thankfully, there's a better way — at least, if you use Google-associated services and devices. Google Smart Lock is an easily overlooked but incredibly useful feature that lets you create a sensible balance between security and convenience. But what is Google Smart Lock, exactly? It's an umbrella term that applies to three core areas: Chrome OS, where it allows your Android phone to unlock your computer; Android itself, where it provides a variety of options for keeping your phone unlocked in preapproved, known-to-be-safe circumstances; and within the Chrome browser, where it acts as a cross-platform password manager for both apps and websites. Best of all? Once you set it up, it's simple as can be to use. Here's a step-by-step guide to turning Google Smart Lock on and taking full advantage of what it can offer across all of its relevant areas. First up: the Android front. 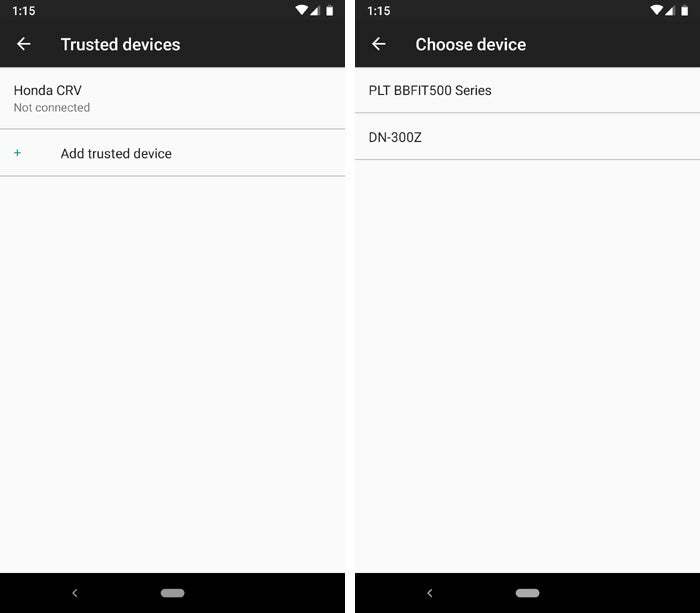 On any reasonably recent Android device, you can set up Google Smart Lock to keep your phone unlocked in certain trusted situations but then to require your PIN, pattern, password, or biometric authentication at all other times. 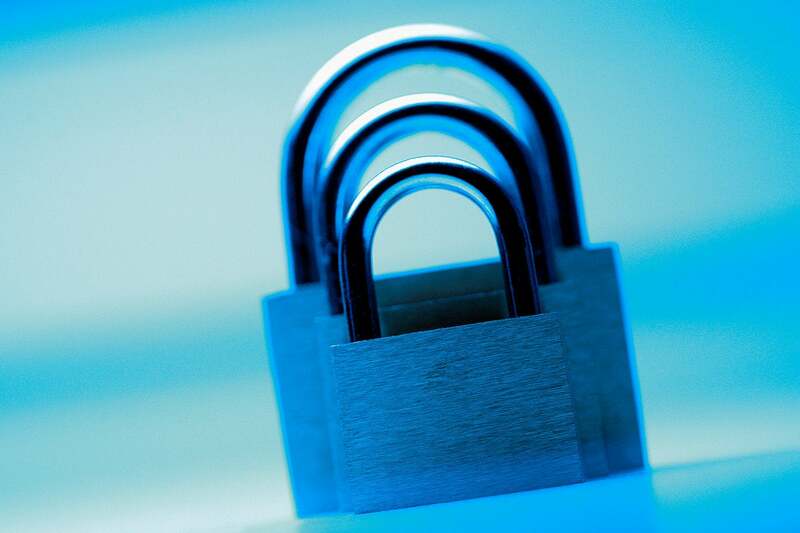 It's the best of both worlds: effective Android security without unnecessary annoyances. On-body detection: Fire up this option, and your phone will remain unlocked whenever you're holding or carrying it — so long as you've already unlocked it once. That way, if you unlock your phone to use it and then put it back into your bag or pocket while walking around, you won't have to unlock it again the next time you pick it up. Anytime your phone is set down or not in motion for more than a moment, it'll require authentication again. Trusted places: Perhaps the most useful Google Smart Lock element, this option allows you to set specific locations — by business name, street address, or manual map placement — at which your phone will never put up a lock screen or require authentication (in theory, at least; the function can sometimes be a bit finicky and require occasional fine-tuning). You'll obviously want to be selective about what places you choose, but configuring this to recognize somewhere like your home can be a helpful way to avoid authentication where it's generally not needed. Trusted devices: If you'd rather have Google Smart Lock recognize a Bluetooth pairing, this next option's for you. It empowers you to tell your phone to skip the lock screen anytime it's connected to a specific Bluetooth device — say, your car's audio system or your gym headphones — when you know the phone will always be in your control. You can add any Bluetooth device that's been paired to your phone as a trusted device and then let it keep your phone unlocked whenever it's connected. Trusted face: Truthfully, this option is probably something you'll try for a few minutes and then disable. It lets you unlock your phone simply by holding it up to your face — but it isn't always reliable and takes just slightly too long to process compared to most other methods. Questions also remain about just how secure it is and how easily it can be tricked by a photo or by someone who looks kind of like you (a possibility the feature's own setup screen even warns about). Perhaps it's not entirely surprising, then, that Google omitted this option from its own recent Pixel 3 device — something that may serve as a sign that its days within Android on the whole are numbered. Voice Match: The recently rebranded Voice Match option lets you access Google Assistant and optionally skip over your lock screen by saying "Hey Google" or "OK Google" — without having to provide any other form of authentication — once you've trained the phone to recognize your voice. That being said, this one, too, seems to be in the midst of a change: On the Pixel 3, instead of being able to unlock your device entirely, Voice Match will display only a limited range of personal results — such as showing you your next appointment — on your lock screen when it recognizes your voice. When it comes to Chrome OS, Google Smart Lock can keep you from having to type in your password every time your computer powers up or wakes from hibernation. It does this by turning your Android phone into a wireless key: Whenever your Android phone is nearby — within about a hundred feet, at most — and unlocked, Chrome OS will show a green open-lock icon on its sign-in screen and prompt you to click your photo instead of entering a password to proceed. 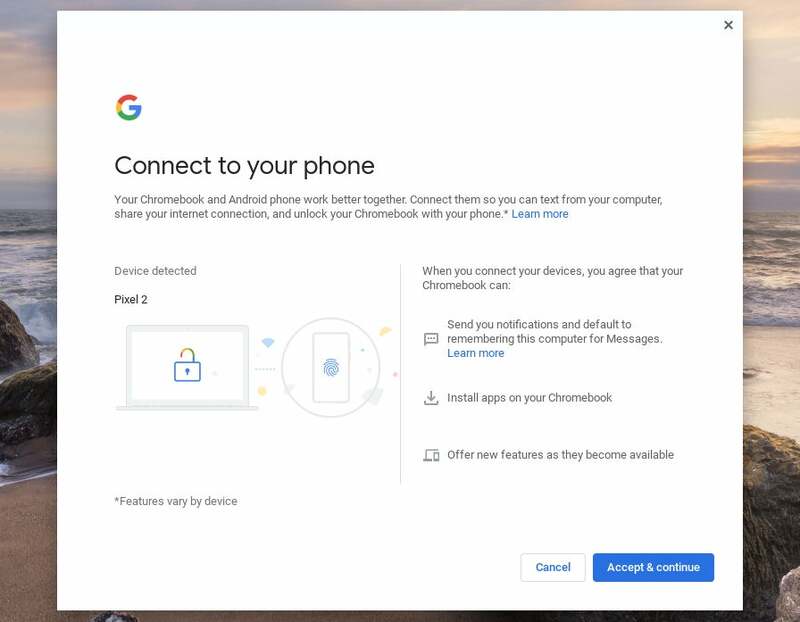 As long as Bluetooth is active on both devices, Chrome OS should automatically find your phone within a few seconds and then walk you through the steps of completing the connection. And a quick tip: When you see the green open-lock icon prompting you to click your photo on your Chromebook's sign-in screen, just hit Enter. That'll get you into your system without requiring you to move your hands off the keyboard. The final function of Google Smart Lock is one that works across Android, Chrome OS, and any desktop platform where you're signed into the Chrome browser. It's a universal password management system, and it's available both inside the browser and within certain mobile apps. In the Chrome browser — on Android or on the desktop — this part of Smart Lock will prompt you to save your username and password whenever you enter that info into a site. It can also create complex new passwords for you when you're signing up for a new site or service. Either way, the next time you return to the site or service, Smart Lock will offer to fill in those credentials for you. The system is also able to sign you in to certain Android apps automatically, though it works only in apps that explicitly support Google Smart Lock — a list that's still frustratingly limited, some three and a half years after the feature's launch. 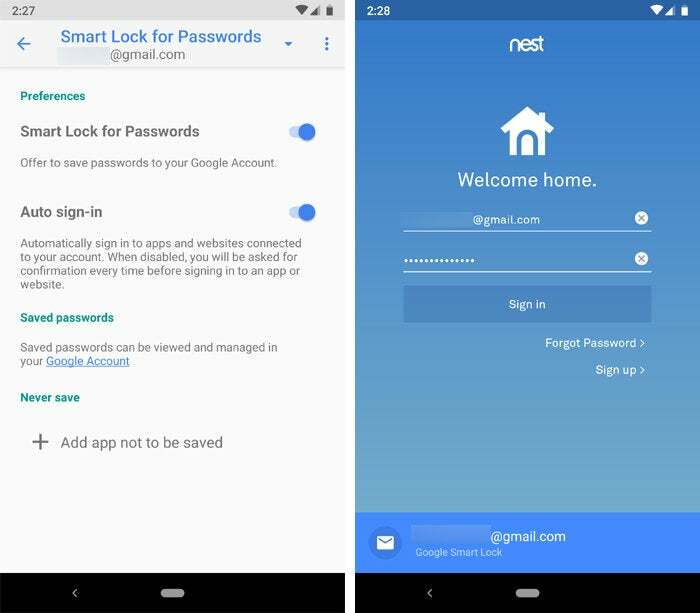 Once you activate Smart Lock for Passwords (at left), Google will remember your credentials and even automatically sign you in to certain apps (at right). The Smart Lock password function is activated by default, so Google should automatically prompt you to save, generate, or fill passwords as appropriate during your browser- and app-using adventures. If you ever want to pull up the feature's settings or disable the system entirely, look for the "Passwords" section within Chrome's settings on the desktop (where, curiously enough, the Smart Lock branding is not currently used) or open the Google section of your Android device's settings and look for the "Smart Lock for Passwords" option. You can also find those same settings and see all of your saved credentials by going to passwords.google.com in any web browser. It's worth noting that you'll find broader in-app support along with additional features and security assurances by using a dedicated password management service such as LastPass, which is my top all-around recommendation for the best password manager on Android (though it works equally well on the desktop and on iOS, too). Such a setup also affords you the opportunity to access and fill in your information in browsers beyond just Chrome, if and when the need arises. But using this element of Google Smart Lock is certainly better than using no password manager at all. Smart Lock, as you can see, is a pretty broad term for a variety of different functions, not all of which are directly related. But now you know what's available and what it all entails — and now you can figure out which Smart Lock elements make sense for you.